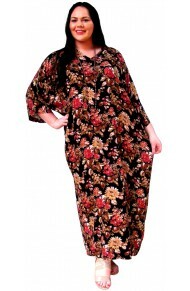 All Plus-sized Kaftan Tops in this range are the same traditional kaftan shape - even though they may appear slightly differently due to the way the model is posing. Obviously, the more slender the wearer, the more folds and looseness the top will have. To give you some idea, the model wearing these tops is UK size 16. There is also a Bespoke service available should you require a size and/or length outside the standard measurements.